The Lowest Energy Cooler In The World! 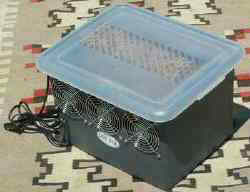 Now Evaprotive Cooling For Your Car, Truck, or RV, for a fraction of the cost of refrigeration! Low energy, just 2.5 amps at 12 volts for the TRI-COOL! Uses CelDektm, which is the most efficient evaporative cooling media on the planet! KAR KOOLtm will cool hot dry air as much as 35 DEGREES! KAR KOOLS: 12 Volts ; 24 Volts by Special Order. CFM's, wattage, and dimension are subject to change without notice. Verify before ordering.